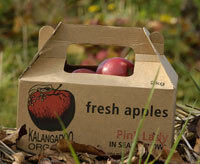 Our apple orchard is certified organic with the National Association for Sustainable Agriculture Australia Ltd. (NASAA). Certification No. 5202. Full organic status was achieved in February 2005.